TriVita Clinic of Integrative Medicine Offers Hormone Therapy for Both Women & Men. 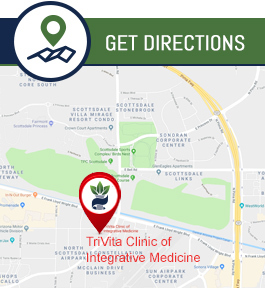 Our Integrative Medicine Clinic Is Conveniently Located at 16100 North, Greenway Hayden Loop, Suite G-100, Scottsdale, AZ 85260. Please Call Us at (480) 725-4474 to Request an Appointment. Hormones are chemical messengers continuously secreted into the bloodstream by endocrine glands to regulate activities of vital organs. Hormones stimulate a multitude of life-giving processes throughout the body which maintain health, harmony, healing, growth and repair. Hormone deficiency affects every cell in the body. Optimal hormone levels have shown to improve energy, cognitive function, cardiovascular function, cholesterol levels, musculoskeletal function, libido and immunity. TriVita Clinic offers bio-identical hormone replacement therapy which means the prescriptive hormones are identical to what is naturally produced by the body. Bio-identical hormone therapy can occur in many forms; you will be able to discuss the best delivery option and treatment options with your medical provider to meet your unique needs. Hormone therapy is for both women and men. If you are experiencing any of the following symptoms, then schedule an appointment to speak with a healthcare provider about hormone therapy. Laboratory tests can be ordered to measure your hormone levels.